30" Bobby (Peach) Meet Bobby. He comes completely dressed as shown. All clothes can be removed and changed. He is about 30 inches tall with legs attached or about 17 inches tall if used as a half body puppet. Legs can easily be snapped on and off as you wish. Remove the legs and you have a wonderful half body puppet perfect for use behind a puppet stage or curtain! Hand enters through bottom. 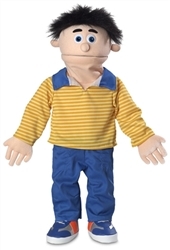 Other features include a seamless face, individual fingers, nylon lycra lining, sewn elbows, light weight foam covered construction, and an extremely easy moving mouth. Professional puppets like these sell for $150 and up. Grab him now at the special introductory price for a limited time! A detachable arm rod (1) is included for hand movement.